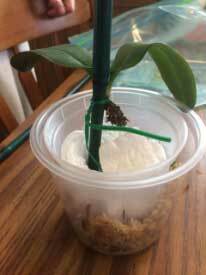 Have a Phalaenopsis orchid with virtually NO roots at all & only 2 leaves at this time. It did well for the first couple years. Got it in bloom & repotted into bark mix after it was done blooming. Bloomed again but got black fuzz on the flowers so removed the flowers. Never has bloomed since. It had a pretty decent root system for the first few years (could see roots through the pot & lots of air roots), also made leaves, but never has had more than 3 leaves at a time. Have always watered every 7-10 days with tap water & has been on a humidity tray for years in an east window (not always the same one though). In summer used half strength dose of fertilizer every other watering (once a month in winter). Used Super Thrive every other time. Repotted yearly if not more often. Tried diff mixes & pots (always clear plastic with drainage holes) over the years without great success. It just sort of went along. Finally in Jan 2016 tried putting it in a smaller pot yet (4 ins) & tried changing to Classic Gold mix from repotme.com that came highly recommended (contains lots of sphagnum moss) that they advertise as being good for struggling plants. Had about 4 or 5 good roots at that time (its root situation has always been very up & down for yrs). After that repotting, It seemed to be doing fairly well. That October (last fall), it grew a new leaf, although not a big one. Two months later (around Xmas), the leaf just inexplicably fell off. It was a top leaf. In January of this yr, we took it out of the pot. It had about 3 roots left. It looked a little black around the crown, so we treated it with Physan 20. I actually don’t think it had disease though. I always do a bare root soak with Super Thrive at repottings too. Then we repotted it into more of the leftover Classic Gold in a 3.5 inch plastic pot. I read that you should not put an orchid that’s been in moss back into bark, so stayed with the same type mix it had been potted in before. Seemed OK for about a month but then in Feb started to look really droopy. Continued watering weekly for about a month after that. Water did not perk it up at all. Last weekend we got it out of the pot. There were virtually NO roots left & not much of a stem but there is a crown & the two leaves left are green. There no air roots (used to have tons of air roots yrs ago, hasn’t had those in a long time). I had gotten more Classic Gold mix thinking maybe it just needed new mix, not leftover. When we got it out of the pot & saw there were no roots I thought the moss-heavy mix might have been the problem. It def did better in the bark in retrospect. So did not use the new orchid mix, tossed that. We would like to try to get it to regrow some roots. What should we do for it? We have no idea. Are currently trying the sphagnum & bag method, but not sure if it’s the best route, or if we’re even doing it right. Have put the 2 leaves with a crown (i.e., plant) into a plastic pot tied to a bamboo stake, anchored in Styrofoam peanuts (in the pot), but no mix & then put that into another slightly larger plastic pot, with some wet sphagnum moss in the bottom of that pot, and put it all into a large ZipLoc bag sealed shut, but then my husband cut a small opening in the side. We tried putting it on the lower shelf of a stand in the E window in the bedroom, kind of out of the way, but not sure if that’s enough light. Right now it’s on the kitchen table on the W side of the house. So we’re looking for any advice you can give about what we’re doing wrong or what to do differently to get it to grow some roots. Thank you! Two pictures are attached. Orchid aficionados are notorious for getting over involved in technical minutia about their plants with complicated formulas for potting media, fertilizers, supplements and watering routines. All too often the basics are overlooked in the plethora of some of these extraneous considerations. Your Phalaenopsis has not benefited from the many changes it has been forced to go through. I suspect that your watering routines have not matched the different potting mixes that you have tried. Various mixes work very well, but each has to be watered differently and properly. At this point, I’m not sure it can be saved. After all, it has already suffered the loss of virtually all of its roots and most of its leaves and those that remain are dehydrated because there are no roots to absorb water for them. It is seriously stressed. If you want to try to salvage it, keep it simple. Find a one or two inch terra cotta pot. Fill it with basic sphagnum moss available at any garden retailer. Loosen the sphagnum moss so it is airy. Typically, it is packed to tightly. Keep this moss damp; never let it get dried out or wet. Rinse the stem thoroughly with a bit of Physan. Insert the rootless stem into the pot of damp moss so the stem is covered, but the leaves are not. 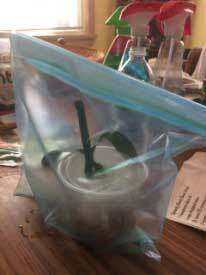 Do not use any plastic to cover the pot or the plant. Keep it in a warm, moderately bright location. Monitor the moss daily and mist the moss thoroughly whenever the surface of the moss feels dry. Do not drench the moss, but spray it enough to keep it barely damp. Forget all the other commercial remedies that promote sales but do nothing for the plant. At best, it will take a long time for new roots to develop and it may already be too late for that. Only time will tell, but don’t change things ever time it starts to deteriorate. Be patient.